For several years now, we’ve been selling all of our videos on DVD as well as the membership here online. Basically, I put our website on a disk, complete with a web-page-like menu. All you had to do was insert the disk, click autorun, and voila! A menu of all the topics available would appear, and you could click on the topic you wanted to learn. All the videos for that topic were displayed inside a player called Theater, making it very quick and simple to click a video you wanted to play, or just sit back and watch as all the videos played one after the other. I thought it was pretty slick. But, nothing in computers ever stays the same. About a year ago, we started to see some people who had problems with the opening menu working. If they had Internet Explorer, and they updated to version 9, our opening menu wouldn’t work. You could see it, but when you clicked a topic, you just got a white screen. Both Jim and I scoured the Internet for a fix, but came up empty handed. So, we just advised that people change their default browser to Chrome and everything worked fine. We didn’t like that solution, people shouldn’t have to change something on their computer to play our videos, but we just didn’t see any choice. We’ve been searching all year for other options. Jim even paid $140 for Roxio software to see if it had a better option for burning videos to disk. We tried it to no avail. Roxio creates a movie style DVD, limited to 1-2 hours. We have over 20 hours worth of .mp4 videos to put on our DVD. So, we keep telling people to use Chrome. Then, last month a Chrome update broke the Theater part of our DVD. The main menu would come up fine, you could click on a topic and be transferred to the Theater player for that topic, but then it would just hang up. Aaaaarrrrggghhh. We have found the exact culprit in the Chrome update and we have a workaround that we’ve detailed on our DVD Help Page, but this is just getting ridiculous! Everything works fine with Firefox – do we dare change our instructions and tell people to use Firefox? But what do we do next time, when Firefox breaks something? We have to find another way to deliver our videos on disk. Last month at ScreenCast Camp (at TechSmith Corp, the folks who make the Theater software) we were among a whole group of people who make screencast videos like ours. I asked everyone we could find if they could think of an alternative. We even sat down with a software developer, showed him the way we currently put our videos on disk, and we brainstormed. Nothing. Everyone kept coming to the same conclusion – just put the videos on the disk, a folder for each topic, and tell people to use their computer’s file system to view the disk, then double click on the video they want to watch. Ugghh! I just didn’t think that was very professional … a DVD you buy should come up with a menu! But, it’s even less professional to have a menu that doesn’t work! Next week is the FMCA Convention and we usually sell quite a few DVDs there because we offer a rally special of a one year membership PLUS the DVD at a very reduced rate. We have to do something. So I’m frantically working to reorganize all the video files. The main thing I have to do is to rename them. If they’re going to be recognizable for a person to double-click on the file, then the filename needs to be understandable. When I linked to the file from a menu system, the filename didn’t matter. Picasa is the really hard one since I have 74 videos just on that topic! I want them subdivided into sections (Basics, Editing, Organizing, etc.) So, I’ve come up with a numbering system of 1.x, 2.x, 3.x etc. I feel like I’m going back to chipping on clay tablets by relying DOS style filenames to keep videos in order, but that’s what has to be done without any menu organizing software. This is a lot of work, but in the end, I think I’m liking it! And, when I create more videos I won’t have to go thru the process of re-creating the menu, just add an appropriately named video file to the folder! Yes, people will need to know how to view a DVD from their computer’s file system (Explorer in Windows, Finder in Mac) but the disk itself now will be so clean! The only contents are .mp4 files – that means nothing to go wrong. Well, I guess there’s still the possibility that a computer could have a problem with .mp4 – you do need a media player. But, those players are usually installed on every computer – or they are a free download. My friend, Dianne, always signs her emails with the phrase “Out of every Bad comes a Good!” We now have a DVD of all our tutorial videos where it’s very easy to see the contents, even to copy the list of files and make a printed Table of Contents, and where nothing can go wrong again! Hey! a girl can dream can’t she? Published by MrsGeek, in Blog. 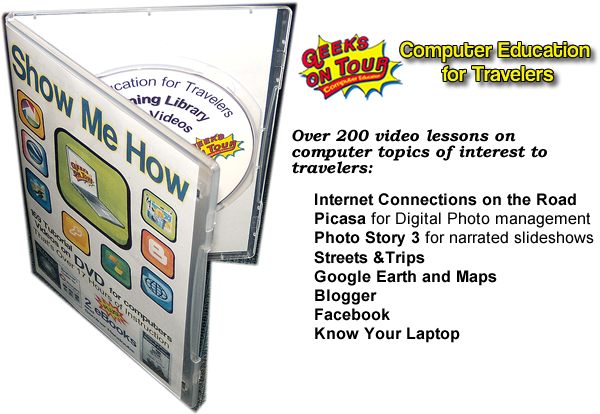 Tagged with DVD menus, Geeks on Tour tutorial videos on DVD. We are planning on Q in January and Nick & Terry’s Western Gathering the end of February. Will you guys make it West this winter? To keep up with computer changes has always been a problem with us “old folks”. Some program that worked so well for so long becomes outdated or the companies come out with new OS. It can become quite frustrating for us. Sounds like you have found a solution, but I was curious if you could have included a copy of the browser that worked with your DVD and made your DVD a boot disk. I am not a techie so I don’t even know if that is possible. Good luck with your upcoming rallies. Interesting thought Judy. But then people would need to boot their computer with our DVD – we want them to be able to put the DVD in whenever they want. Keep that thinking cap on! Will you be at Nick’s?